Master spy novelist John le Carré's 1974 story about the British Intelligence agency search for a Soviet mole in their top tier of agents. It's based on the revelations in the 1950-60's which exposed the Cambridge Five who were KGB moles in the SIS. It's also the first in a trilogy of novels involving agent George Smiley who had been forced to retire. Director Tomas Alfredson of Let the Right One In and screen writers Bridget O'Conner and Peter Straughan have painstakingly detailed Cold War London. Unfortunately you need a dossier (as was handed out at the screening) to make heads and tails of the characters involved. 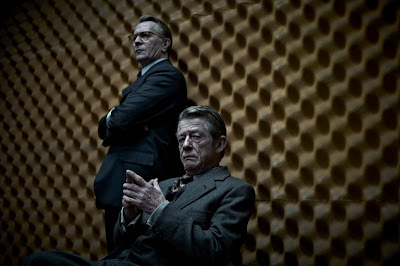 John Hurt plays “Control” the chief of the Secret Intelligence Service. He's been obsessed with finding the mole in the agency that has been feeding information to Russia. He gets intel that a general in Bulgaria wants to defect and can supply the name of the traitor. He sends out Jim Prideaux (Mark Strong) to get the general and bring him back. But the operation goes sideways and Jim is shot. It's created a mess within their intelligence “cousins”. The pressure is on the clean it up. Control is forced to retire with his Deputy Chief George Smiley (Gary Oldman). After Control dies Permanent Undersecretary Oliver Lacon (Simon McBurney) brings Smiley back working off the grid to investigate Controls suspicions of the “Magic Circle” in the “Witchcraft” operation. Control had assigned them code names of Tinker, Tailor, Soldier, Sailor, Rich Man, Poor Man, Beggar Man Thief. Colin Firth as Bill Haydon, Ciarán Hinds as Roy Bland, Toby Jones as the new Conrol Percy Alleline and David Dencik as Toy Esterhase. Smiley is given Peter Guillam (Benedict Cumberbatch) who is head of the Scalphunters (agents who deal with the dark side of the job) to work as his assistant. Smiley comes home one day and finds scalphunter Ricki Tarr (Tom Hardy) hiding there. He was the one who told Control about the mole and he's being set up to take the fall. If you think this is confusing, it is. The set decoration, the early 70's London costumes, cars are filmed in a palid light giving a feeling of age and dusty corners. This is a time before cell phones, and computer gadgetry. Women are not in power positions. They are regulated to the secretary pools and getting hit on by the men. The movie is way too long and the complicated plot which works in novel form much better as you can reread the convoluted plot points. Unless you can instinctively understands the trade craft terms the agents bandy about you have a a better chance of sorting through all the characters. In 1979 the BBC adapted the book for a television as a seven part series with Alex Guiness as Smiley which would have worked better than compressing the characters and events into a 2 hour movie. Good performances but overloaded and boggling if you are still around for the ending, more power to you.